Giveaway: Your very own pair of "Sue Earrings". Shown Below. Compliments of Armelle Jewelry. Armelle jewelry is a line of feminine, modern, and delicate pieces that capture a spirit of fun and uniqueness. The collection includes handmade one of a kind earrings, necklaces, and bracelets, that use only the best materials, to ensure the best quality. You can see the rest of her jewelry pieces here. Not only does Caroline make beautiful jewelry, but she is also a photographer, runs a personal blog where she "writes what she is thinking as she is doing what she is doing". She recently shared the wall paper she put up in her new studio. You have to check it out. Don't forget she shares recipes here also. CJane will also recieve her own pair of "Sue Earrings". Leave a comment on this post telling me what piece of Armelle Jewelry would look best on you. I love these earring!!!! I think these ones are my favorite. The lola earrings are great...but so are so many more! Those earrings are the best. Very feminine and gorgeous! I like the Sue earrings. This is such a neat idea. I love reading Cjane! I love the jewel necklacke, her designs are so beautiful and simple. I REALLY love the Betty Necklace! Way too cute! The Ella necklace is so cool! I love the vintage red lilly earrings. Adorable! I adore the emma earings! I follow armelle the blog, too! I love the madison earrings. The Betty Necklace is my favorite!! The Sadie necklace is awfully sweet! The Ella necklace is beautiful - so simple and yet, so elegant! The FV button is on my blog, baby! I could rock the socks off the Betty Necklace. I follow the Armelle blog. i love the sue earrings and i have a ton of her jewelry from the beehive bazaar. love it all. i love the spanish rose necklace. i'm trying to branch out and wear gold more often... this would be perfect!! Any of those lovely necklaces - the more the merrier! Love the Megan or Alexis earrings. 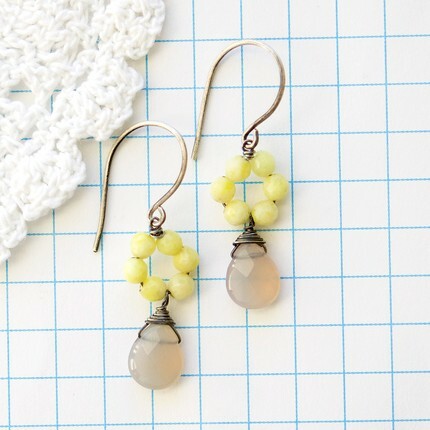 I'd love any of the cute earrings, but I think the Raegan earrings would match my Easter dress! The sandra earrings are so pretty and feminine! I love the Alexis black earrings! The Julianne Necklace. It is GORGEOUS! I would have to class myself up a bit for it to be the one to look the best on me but boy do I want it! I normally have problems with necklaces, but I do believe the Julianne meets my criteria for the perfect neckpiece. I love the gloria earrings. the julianne necklace is gorgeous (in silver). thanks for the opportunity! I'm in love with the Gwyneth earrings. I love the Alexis Black Earrings. One Spanish Rose Necklace, if you please! Love the Sadie necklace! SO beautiful! The Julianne necklace is lovely! I like the Megan earrings, it would be hard to chose. The Samantha earrings are my favorite! The Sue earrings are perfect for me! i love the gloria earrings! Zoey earrings- love the colors! i love the grettle earings. The diana necklace is so delicate and feminine. the sandra earrings are too cute! I love the Sadie Necklace...simple but so lovely. I love the Sandra earrings! So pretty. The Zoey earrings for sure. And if I won them then I'd buy the Ella necklace to match! Love the Julianne necklace...I love pearls! i like the julianne and the jessica, but everything is lovely! I love the Jewel necklace. I'm rarely that fancy, but it's so pretty - I like the asymmetry. I would love to wear the ella necklace...though it's hard to pick! I'm loving the Silvia Earrings! Hard to choose but i'd pick the julianne necklace. I like the julianne necklace too! I am obsessed with leaves. I am a follower of fv. The Sandra earrings are fabulous!!! I love them! nathalie or lola are sooo pretty! well they all are:) but those are my faves!!! I love all of this stuff, its classy and simply, but you could really dress up an outfit very quickly! samantha earrings! i am loving this gold, but not yellowy gold, earrings. please please please! the julianne necklace is beautiful! The ella necklace is gorgeous! i love the alexis earrings! I don't have pierced ears so it has to be the necklaces for me. The julianne and the sadie necklaces are so lovely! I like the Jessica and Julianne necklaces! I love the Gracie Brass Earrings and the Betty Necklace. So pretty. I love the sandra earrings they remind me of spring. Cute, cute...the Alexis earrings are fabulous! How could they all not look their best? if I had to pick a favorite, I'd go with the Sienna necklace. I'm loving the turquiose with the lime! Oh, these are all so pretty! I think the Julianne necklace is so lovely. The Julianne necklace definitely caught my eye. the jewel necklace is stunning! All the pieces are beautiful. The Emilee earrings are so unique! The Julianne necklace is stunning and dainty! I love the color combinations! Especially the Isabella earrings. So fun for spring. The Samantha earrings are really cute! Harriet earrings all the way! I need some spice in my life! I love the Sydney earrings. I love the sydney earrings. So cute and unique. I love the lola earrings!! My favorite is a sale item on etsy and i'll probably have to buy it before it gets snatched up....its the Skylar Necklace. julianne necklace! although I think they are all great! I'm loving the small je t'aime brass pendant necklace. I love the lola earrings. Cute stuff! i sure love the betty necklace! Love the Sue earrings. Oh I how i want them! I love the katelyn earrings. I would love to give these earrings to my best friend! her birthday is coming up and she'd look great in these! I love the Betty necklace. I love the julianne necklace. I would seriously consider wearing that for my wedding in August. The ella necklace is lovely and unique. Such pretty options! I love the madison earrings-- especially the dangling crystals at the bottom. ooooh, a BIG fan of the Sandra and Nathalie earrings...so pur-tee. the sandra earrings are beautiful! Love the Julienne necklace. Such pretty pieces! I think the raegan earrings would look awesome on me, but honestly all the jewelry is lovely. Truly lovely. I love the Sandra earrings. I have really been loving the jade and peach color combination lately. So pretty! The Sandra earrings are bee-yoo-tee-full! the ella necklace is just my style. I love every single one of those earrings. Seriously, I can't choose! The Ava earrings. How cute are those? I love the Hannah earrings! I would look fabulous in the Juileanne necklace! I also follow the Armelle blog. I love the Samantha earrings! I am sending my husband the link to this site- I have never heard of them before, but her jewlery is very much my style. I like the gloria earings, the betty necklace, and the julianne necklace. The julianne necklace is darling. The Sue Earrings go perfectly with my new spring dress. I love the Sue earrings are great--so spring. I also love the Sandra earrings. I LOVE the Julianne necklace!! Wow! The Danielle earrings are my favorite! They are all very unique, love them. I would love the Julianne necklace. Courtney earrings, soooo prettttyyyy !! The morgan earrings are totally me! The Julianne necklace is just what i'm missing! I like the Ella necklace. The Sandra earrings are my favorite. I love the rose detail. I love the Lola earrings. The Julianne Necklace is my favorite. I love to dress up my mommy outfit of t-shirt and jeans with a cute pair of earrings. I absolutely adore the Isabella earrings. gwyneth earrings please. this is fun. hope you have fun pushing courtney! I love the gloria earings. They are stunning. The Sue Earrings are perfect! Love the Charlotte and Sierra necklaces! And the Gracie and Sue Earrings are beautiful...can't pick just one! I'm Sue so I like the Sue earrings! I love the Gloria Earrings!! !